When you are bow hunting every shot counts and you are depending on the accuracy of the shots you make. The accuracy of your arrows comes, not just from practice and sharpening your archery skills, but also with exceptional equipment like selecting the best bow sight on the market. Whether you are an archer who participates in competitions or a hunter who stalks small and mid-sized game, an investment into a bow sight means a greater degree of consistency with every shot. When it comes to choosing a bow sight you might be surprised at just how many styles and features exist. 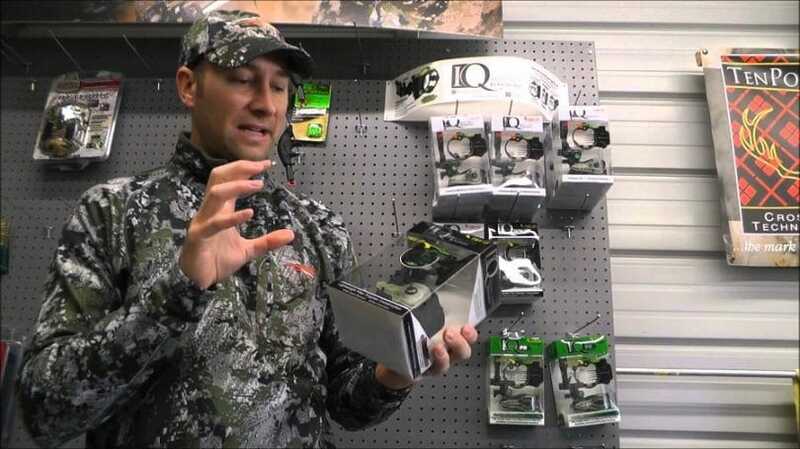 In fact, until you begin to explore your bow sight options in depth, the selection process might even overwhelm you. There is much to consider in the bow buying process, from sight type to configuration of the sight you select. Check out our piece on how to choose the best survival bow for more options. A quality bow sight is a small piece of equipment mounted on a bow’s riser. Once mounted, the device indicates the point at which the archer has a projectile aimed, and installing one eliminates the need of the highly ineffective and inaccurate method of instinctive shooting. Essentially, the bow sight acts the same way a sight on the a rifle or pistol still works by giving the archer the ability to aim a shot with greater precision. Bow sight designs vary; some sights are simplistic while others have far more advanced features. 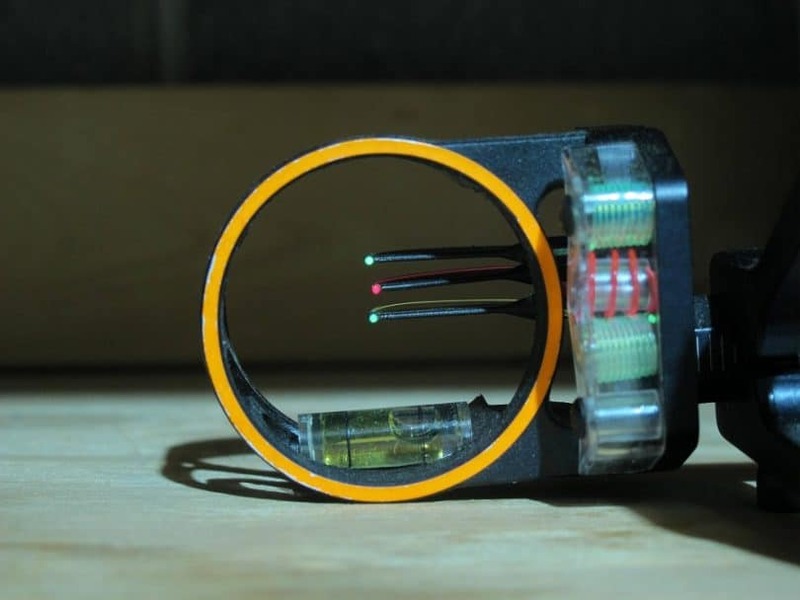 An example of a simple bow sight would include one featuring a mounting bracket that attaches to the bow riser, pin guard, pins, and a pin track, like one might find in a plastic, fiber optic, three pins composite bow sight. The pins in the bow sight are movable and the archer can position them in the desired position within the track on or by adjusting windage adjustment via the mounting. The latter type of sight is not only simple to use and in design, but it also has a great price point. There are three chief styles of bow sights you can choose, each with variable features. The three main types are fixed pins, moveable pins, and Tree stand or Pendulum bow sights. Main feature: No readjustment of yardage when out in the wild. Good for target shooting and hunting endeavors alike. ·A sight with several different pins each of which marks off a particular distance and separated by intervals of a fixed amount. For instance, if you buy a sight with three pins you might set the yardage intervals at 30, 40, and 50 yards. You can also customize the sight based on your elevation, windage and the distance of the shot you want to take with your bow. ·In contrast to the fixed pin model, the moveable pins model often features a single pin that the hunter can move and reset every time he or she wants to change up the yardage on the unit. 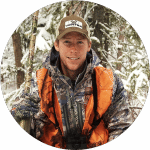 Main feature: Accurate Shots from an unusual viewing angle ·When in a tree stand you have a unique perspective or elevated view of a shot when you are firing downward. 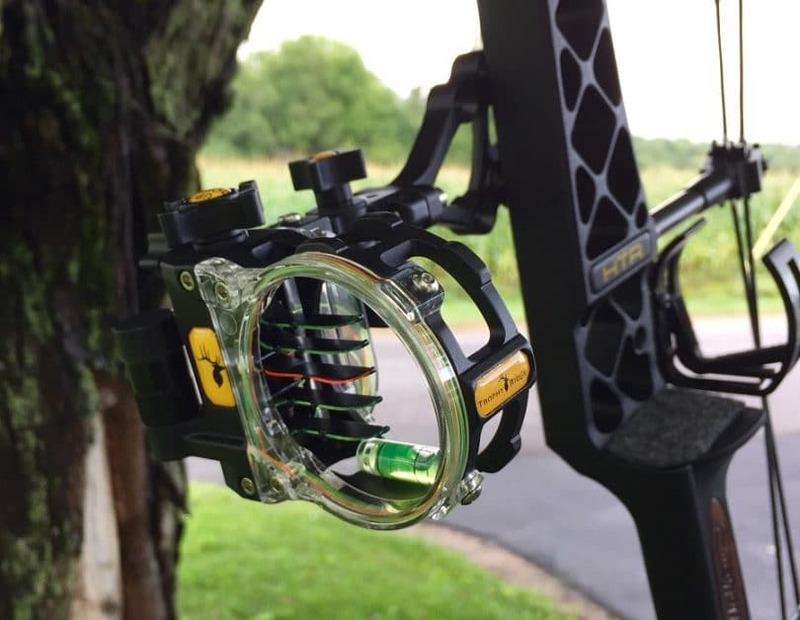 The Pendulum tree stand helps to balance your perspective to ensure greater shot accuracy. If you are hunting prey it is imperative you set the Pins on your bow sight correctly since each pin is indicative of the distance between you and you are the animal you hunt. When you have multiple pins, the pins will be separated from one another by equal amounts of distance. For example, if you are hunting a whitetail deer or alternative small game animals, you will need to be able to make a shot within 30 yards for an ethical kill. You can, of course, take a longer shot, but your risks increase in doing so. Pins set in increments can improve your shot over a longer distance. Many hunters find a preference for three pin fixed bow sights. Each pin is set about ten increments from the other, so there is a pin set at 30, another at 40, and another at 50. The setup of pins makes it visually easy to adjust one’s aim before taking a shot. Meanwhile, five pin sights are used by hunters and target range competitors alike. The pins are used for sighting in the bow. Once you have had a chance to take a shot with the bow, you will use the pins to follow the arrow on a practice target. For instance, if you aim, fire and strike the target and the arrow hits high and to the right of the target, you will position the first pin high and to the right before firing again. The sighting in process is repetitious and is done until the striking of the center of a selected target is reproduced with ease. After you make a strike at ten years, move out to the next yardage increment and sight in the bow for the new distance marker. You might do well starting at a yardage of 20 yards out – this is aligned with the most contemporary bows on the market. Repeat this until you are consistently hitting the bulls eye. Once hitting the bullseye at ten yards, move back to 20 yards and readjust so your top pin is sighted in for a 20-yard shot. Your top pin will be your 20-yard pin. Thus, a three-pin setup will have yardage markings for 20, 30, and 40 and the five-line set up will cover 20 through 60 yards provided the increments are 10 yards in between. When you are using a sight in a competition it is usually easy to see the pins and parts that are adjustable. However, when hunting, sometimes you will find yourself in low lighting or in a position where your perspective is skewed. Level The inclusion of a bubble level on the bow sight helps you become more comfortable when you are dealing with a mildly distorted perception. Let’s face it, if you are hunting on the ground and you climb into a tree stand for elevation and a better view, this can become a bit disorienting since you have to should forward and down with your bow and arrow. Lights Some states may not allow the use of lights with bow sights. You must find out if it is legal to use such equipment in your area. 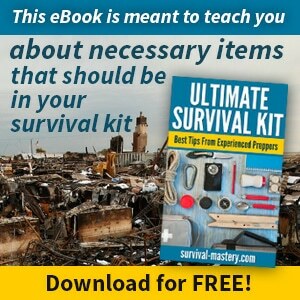 A small light might prove worthwhile if it is dark, growing dark, or if the forest and foliage become extra dense in certain wooded areas where you hunt. If allowed, the extra lighting is great for preventing eye strain at dusk and dawn. Fiber optics Modern bow sights are fitted with superior fiber optic features. At one time frowned upon because of the halo effect such features produced, the modern bow sights no longer have that blinding halo effect. 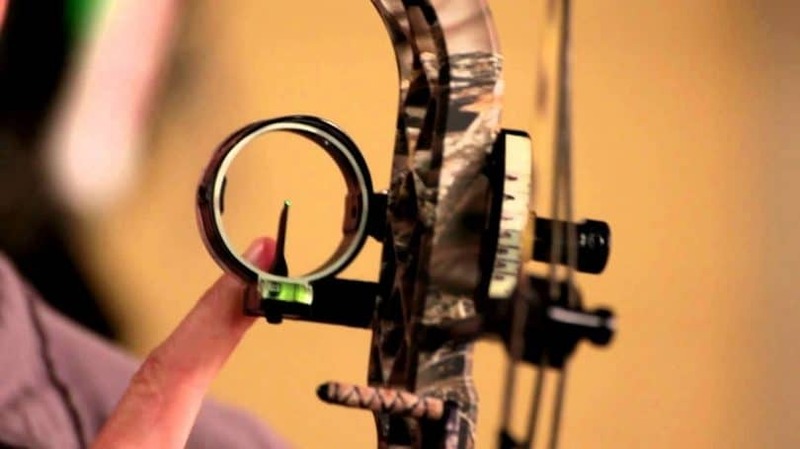 If you opt for a bow sight with fiber optics, choose one that offers a few inches of cable. 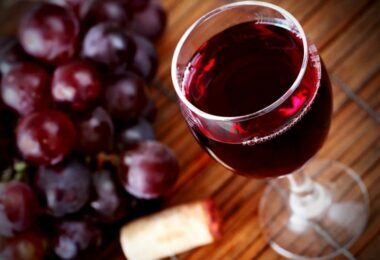 This ensures the absence of the undesired halo effect. 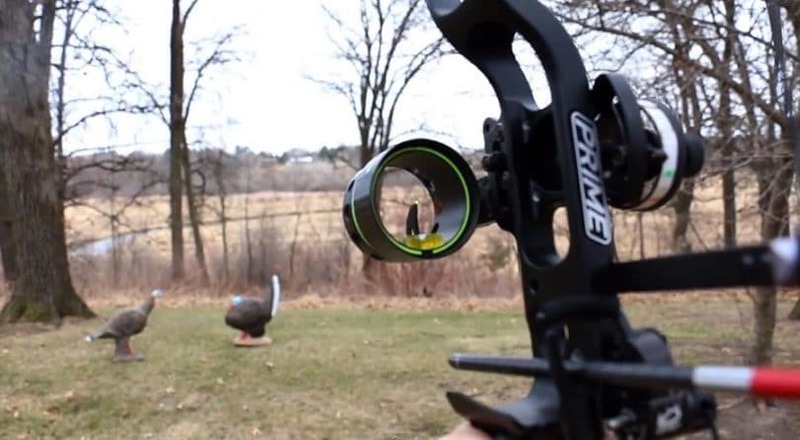 Peeps sights are installed on the bowstring and the hunter can close one eye while using the other eye to look through the hole at whatever pin he or she chooses to use when aiming a bow. 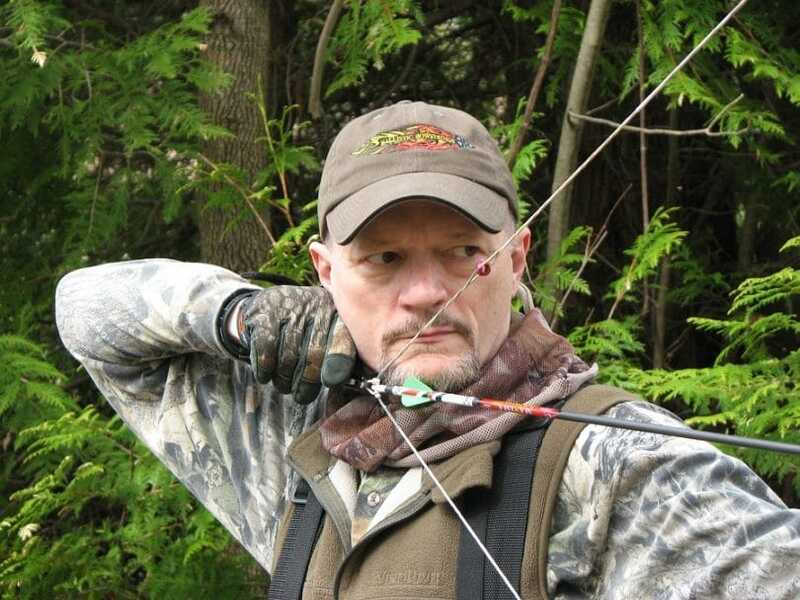 Once a hunter puts sights on the bow the individual must continually practice to adjust the sights to ensure the accuracy of the shot and tight groupings. The peep sights is used in conjunction with a three to five pin bow sight to offer up a greater degree of accuracy when you fire. Once the hunter draws back the bow and peers through the peep sight it becomes easier to identify the appropriate pin with greater speed. 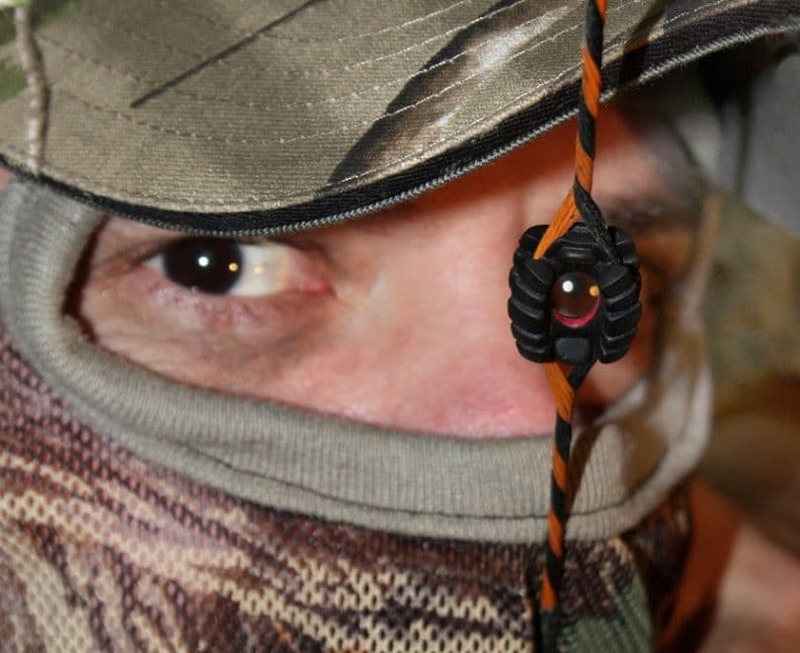 The peep sight is, in general, a focus tool, and one that helps to narrow down the hunter’s field of vision to a more precise point of reference, all while helping to minimize visual distractions. The peep sight is a tool that helps the hunter establish repeatability: The prime factor in shot accuracy and consistency. With the peep sight the hunter has an easier time of drawing and anchoring at the same precise point each and every time. Peep sights are available in a wide range of styles, diameters, sizes, colors, and materials. 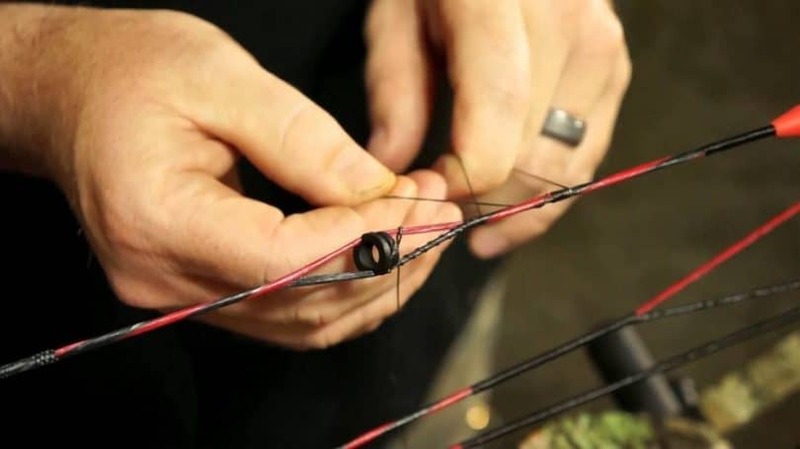 You no longer have to use a peep sight featuring rubber tubing if and when you have a quality bow string with a d loop in it. Common materials used to make peeps include aluminum, titanium, but the material of the peep is less important than the diameter of the unit. The peeps are available in sizes from 5/16 to 3/32, with the 3/16 and 3/4 begin the most popular among hunters today. 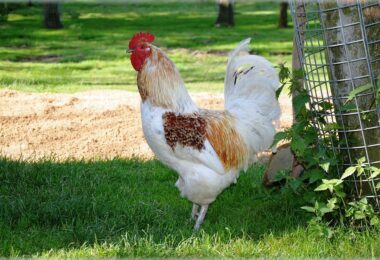 The general rule of thumb is the smaller the peep is the more accurate it is, but the downside to this is the smaller peeps allow for less light to get into the focused point. The Truglo Versa Peep Sight is available in left or right hand dominant options and it has black, green, and red colors. The unit is priced reasonably at $13.14 to $19.99. The peep is Precision CNC Machined and made of lightweight aluminum materials. For the reasonably affordable price you pay, the Truglo Versa Peep Sight gives you tons of versatility because of the easy interchange of peep inserts. The unit is durable, well designed, visually pleasing, easy to use, and definitely a good value for one’s investment. With just a bit of practice and in as little as ten shots you will be able to set your peep sight exactly the way it should be. All you have to do is take test shots and gently move the peep up and down the string until it is aligned properly with the sight you choose. The materials in the Truglo Versa Peep are high quality so you can count on owning the unit for the long term. The peep has interchangeable inserts so you can change the size from 1/8 inch to 5/32 inches to 3/16 inch if you desire. Insert colors are green, red, and black. Green neon insert offers up a good degree of visibility in otherwise low light environments. The Trophy Ridge 3 Pin Bow sight among the best bow sights for the money, particularly the Mist model which is available in left or right hand models. The exterior of the sight is black. In terms of price points, the Trophy Ridge 3 Pin Bow Sight is one of the most affordable options. The Field Logic IQ Pro 5-Pin Archery Sight is available in left and right hand models. This fixed pin bow sight is priced between $169.60 and $209.99 and the sight is another among the best bow sights for hunting. The HHA OL-5519 Optimizer Lite Sight features a price between $127.94 and $139.99. The single pin bow sight is one of the best bow sights you can buy for the money. Sight in the bow sight at 20 and 60 yards and you get dialed in from 20 to 80 yards in increments of five yards. This bow sight is ideal for those who like target shooting or hunting. The sight comes with a pre-printed yardage sticker saving you the trouble of having to go through and set up the distances on your own. Hunters have come to appreciate the ease associated with the sight’s adjustments and the accuracy the sight produces. The sight is simple to install and will fit most compound bows. The sight requires manual adjustment when you make yardage changes; it is therefore a sight that is best for skilled hunters. 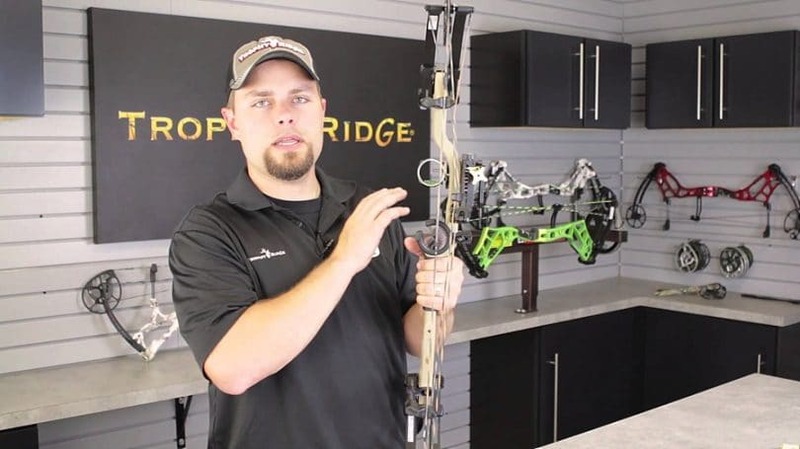 See our list of the top compound bows for more choices. 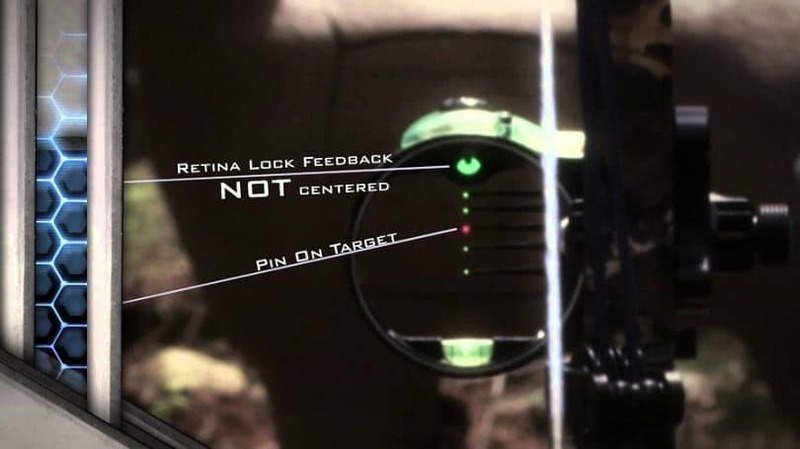 The TRUGLO Bow sight is a 0.029 one-pin pendulum bow sight and it is one of the best bow sights for hunting. The exterior of the unit is black. 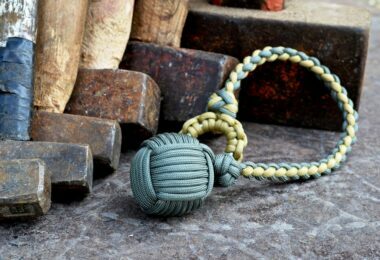 It features a price tag ranging from $79.00 to $129.00. 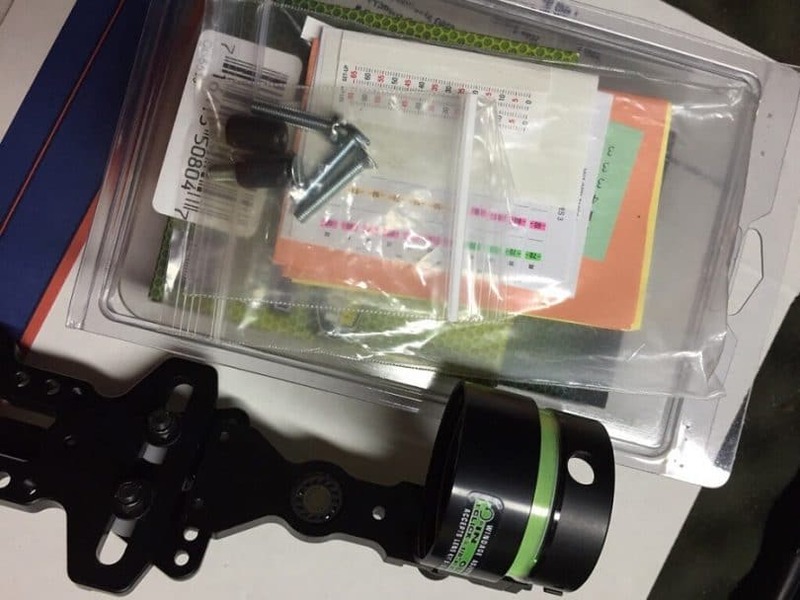 The pendulum tree stand bow sight is capable of compensating for up to 35 yards distance and if you are on the ground shooting, you can lock the pendulum into position. Since you can adjust the unit in tree stands or on the ground, you essentially end up with two bow sights built into a single accessory. The Sports Optimizer Lite King Pin .010 Bow Sight is manufactured by HHA, and it is one of the most exceptional bow sights on the market for those archers who enjoy participating competitions. As one of the more advanced bow sights available, the premium features of this sight come with the premium price tag ranging between $382.98 and $399.99. The Sports Optimizer Lite King Pin .010 Bow Sight features a black, sleek looking exterior, a “Blind 20” function that allows for a no look return to a predetermined distance most common to you. The brass rack and pinion assures a smooth delivery and you can make fast changes between draw weight combos or multiple arrow combinations. The sight comes in left or right hand models. As an archer, whether you are bow shooting for the hunt or you participate in competitions, you want every shot to be as accurate as possible. You can achieve this level of accuracy when you make an investment into the best bow sight you can buy. 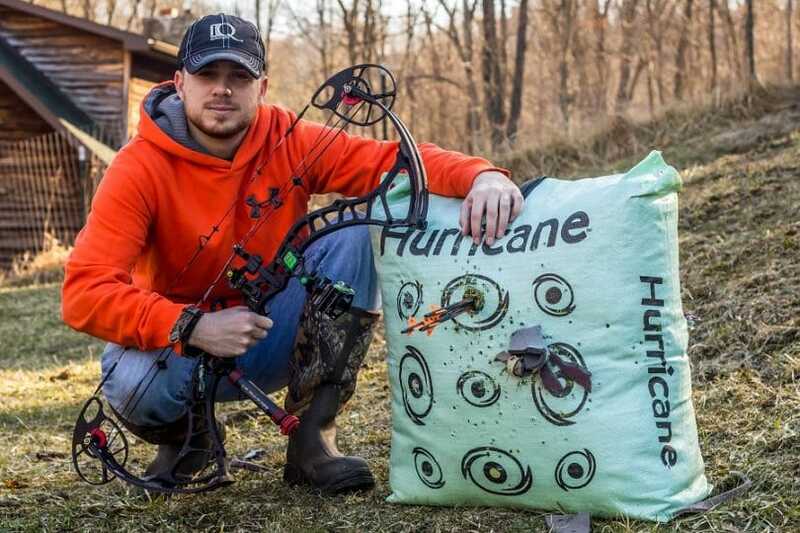 Clean shots with consistent, tight groupings happen when there is a balance between archery skill and the use of exceptional, high quality bow sights. 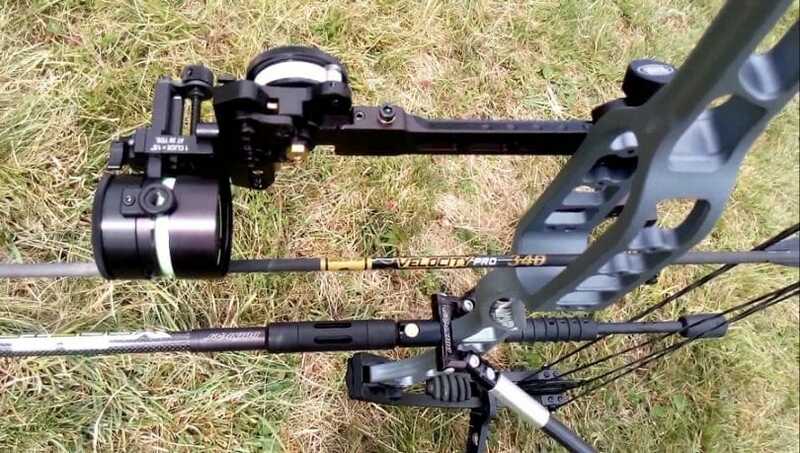 Manufacturers of archery accessories make contemporary bow sights in an array of configurations, some with a simple design and some with features much more advanced. By exploring the various sight types, features, and sight operations, you can discover the ideal bow sight for your needs and for every type of archery situation.